Tired of the heavy wooden “Chinese” furniture ? Want something new, more modern, stylish and comfortable ? Expats in Vientiane are now offered a wide range of styles and tastes from traditional to contemporary. Furniture selections include bedroom furniture, living room furniture, dining furniture and occasional furniture. Before I left for my first trip to Laos, I was advised by my doctor that I needed a myriad of different vaccinations. My arm was certainly sore after I left the clinic that day! I wondered, of course, were these shots really necessary? Would Laos be a dangerous place teeming with bacteria, viruses and rabid wildlife? Now that I have the medicine in my veins, it’s too late for me to worry about it, but I wanted to provide newcomers with this information so that they can choose for themselves which vaccinations they really need, and which they don’t. At this festive season of the year, we would like to thank our customers for your treasured support given to us. We value your patronage and appreciate your confidence in us. We wish you a Happy New Year celebration and a …….. There are always a large volume of rental houses targeted at any one time in Vientiane. The difficulty lies in separating quality homes from those which are clearly substandard. I estimate that only around 25% of rental properties available at any one time are of sufficient standard to house expatriates. Short supply of livable properties creates high and fast-paced competition amongst potential tenants. Even more it’s important for an Expat to understand the mechanics of the Lao Real Estate market. First of all let me start with the agents: …..
I’ve had them all in my garden: snakes, spiders, scorpions and other creepy crawleys… but recently, after 11 years in Laos, I came face to face with a new and truly scary species: the Giant Red Centipede (Scolopendra subspinipes). When I saw it crawling around I was totally dismayed that such a creature might be living in my yard…. and actually I noticed it under my dining table (inside the house) while having dinner ! Yes, these guys are predators and are highly venomous … this one was probably looking for a big dinner himself …. Unfortunately, the local hospitals are still a “no-go” for foreigners due their lack of the most basic equipment. Most expats in Vientiane visit either the Alliance International Medical Centre (“Thai Clinic”), the French Embassy Medical Centre (“French Clinic”) or the Medical Clinic at the Australian Embassy (“Australian Clinic”). Vientiane International School (VIS), the largest international school in Vientiane is currently reviewing their existing contract for food services. Suitably qualified organizations and individuals are invited to submit details of their interest and capacity to provide services to the students, staff and community of VIS. Interested parties are invited to attend an on-site briefing on Thursday 20th February 2014 at 3pm in the Sala Coffee Shop. To register for the briefing and to receive the information package, please contact …..
Lanith (Lao National Institute of Tourism and Hospitality) topped nearly 200 entrants from more than 50 countries to reach the finals for the coveted 10th World Travel & Tourism Council’s (WTTC) Tourism for Tomorrow’s People Award 2014. WTTC recognises sustainable tourism best practices in worldwide businesses and destinations. More than 20 independent expert judges from around the world selected Lanith as one of three finalists, as the Lao institute best demonstrates the “delivery of social and economic benefits to local people, and engagement in environmentally friendly operations,” according to WTTC. The heads of provincial police from across the country pinpointed Laos’ drug abuse epidemic as a major social problem at their annual meeting yesterday, coming together in an attempt to address the issue. “Drugs have become a serious problem in our country adding to the crimes occurring in Laos, so we should find a way to fight against this issue in the near future. This meeting will firstly focus on this social problem in Laos,” Department Director General, Brigadier General Police Sisavath Keomalavong said. According to the department’s records, there were 1,319 reported drug-related offences committed nationwide in 2013 and police arrested 1,971 people including ….. Since the 50′s, a lot has changed in way of women’s rights and their duties in and out of the house. I highly doubt any company could get away with phrases like “The Chef does everything but cook – that’s what wives are for!” nowadays. Well, maybe I’m wrong, as today I found in my letter box an advertising leaflet with the following slogan: “To become the BEST WIFE & MOM in Laos” …. how to achieve this? You just need to buy the latest kitchen from iFurniture. The vintage ads are sexist and not very appropriate (but still funny nonetheless), but how do you feel about the latest …. Sabaidee Magazine, one of Laos’ most popular travel and lifestyle publications, has revamped its design and content to incorporate a new 22-page listings section that can be used as a country guide by locals, expatriates and those passing through on holidays or business. The new listings detail the best places to eat, drink, shop, sleep and relax in the main cities and visitor hotspots throughout Laos. Sabaidee also outlines a host of activities in their See & Do section that families, couples or friends can get up to. Nam Phou: City Centre or Dumping Centre ? Nam Phou, located in Vientiane’s city center, always has been a meeting place for local residents spending time relaxing and enjoying their free time. During French colonialism, the area was designed as a market before being developed into a fountain 50 years ago. One year ago, after being renovated, the Nam Phou fountain reopened to the public and international tourists. Have you visited Nam Phou recently ? You will be surprised, guaranteed ! In every corner there are rubbish bags piling up and the public space is obstructed with metal structures for tents, wood and metal scrap. If that isn’t enough to scare of the visitors, the piled up chairs and tables (mostly all broken) will do the rest. Before the redevelopment the Nam Phou was ….. There is a new café & bakery in town … Parisien Café. It’s the latest addition to the many coffee shops in Vientiane and for sure many Expats will try out Parisien Café as an alternative to Joma. Parisien Café is large, offering lots of different kind of seating and the huge brick walls provide a cozy warm atmosphere. Very attractive is the display of the bakery products, offering a large variety of breads, pastries, cookies and muffins. Also on display are many delicious cakes and desserts. I went for a Cappuccino (Kip 22,000) and a Custard ……. Scrolling through my phone’s app store, I discovered this very cool app teaching the basic of the Lao language. The developer, Santi Anousaya, created this new app to assist and promote the learning of Lao basic alphabets, vowels, and numbers, all based on 1st grade learning materials. Santi adds that more learning materials (e.g. composite alphabets, composite vowels, accents, etc.) will be added in a future version. It’s easy to use, not only you can see the Lao letters, but hear the …. iOS 7: Update Errors And Torturous Download Times ? Here’s Our Tip ! Apple has released its latest operating system for the iPhone, iPad and iPod Touch. Of course you don’t need to upgrade to iOS 7 immediately. You can bide your time, ignore the hype and just skip the longish wait times you’re are likely to encounter downloading the update during these days. And yes, iOS 6 works fine and should continue to indefinitely. There’s nothing so pressing or fantastic about Apple’s mobile-OS makeover that your iPhone or iPad or iPod Touch can’t live without it. Unfortunately many Apple users in Laos are facing update errors and torturous download times, no wonder, the size of the download is roughly a gigabyte. There is a better, faster and much cheaper way to get your iOS 7: ……. Beeline proudly announced that they have deployed the first fiber-based broadband network, delivering ultra high speed internet connection to homes and offices in Vientiane. According to Beeline, the network is currently undergoing a rigorous testing phase and commercial launch of this exciting technology will be in October this year. The deployment of the Fiber-To-The-Home (FTTH) network by Beeline makes Vientiane a member of an exclusive worldwide list of cities which has access to this cutting edge technology. FTTH is a new technology that allows access to the internet and data transmissions up to 100 Mbps. With FTTH, everyone can get …. Have you made Laos your new home? Are you thinking about moving to Laos ? If you want meet like minded Expats living in Laos then you have come to the right place. Join J&C Expat Forum and discuss food, meet friends, talk property in Vientiane, finances, jobs and much much more. There is no such thing as a stupid question. Someone else is already wondering about the question you’re about to ask. Beat them to the punch. Or do you simply want to sell your car, motorbike, computer or …. post it onto our forum ! Soho Si Muang Pizzeria and Rotisserie is the new place to visit in town, especially if you are a pizza lover like me. Soho Si Muang is managed by Van & Joseph, who have both been living for many years in Canada. They love sharing quality time with friends and family and combined with their passion for good food, they decided to move to Vientiane and open a Pizzeria and Rotisserie based on the same concept as seen in New York and Italy. Amir, the third Soho team member, is an experienced pizzaiolo who lived & worked for over 10 years in Italy. As Soho Si Muang is located at J&C’s former office building, the entire J&C team assembled to taste Soho’s pizzas. We ordered …. J&C has received copies of phising e-mails, which have been sent to BCEL customers in an attempt to gather personal and financial information from the account holder. Further a link is provided, where the account holder is requested to provide his personal information. In general, the number and sophistication of phishing scams sent out to consumers is continuing to increase dramatically. Phishing is an e-mail fraud method in which the perpetrator …. It’s my first time to write a review on a noodle shop, not because I don’t like pho or kao piak, but because I would feel strange writing about one of those side of the street shops where you sit on a stone bench and look into the begging eyes of a dog while trying to keep the flies away from your soup. This review is different though, the Noodle House is a clean, stylish, fully air-conditioned restaurant, where clients are welcomed by friendly staff. The interior of Noodle House is very trendy & stylish (reminds me more of a bar than a noodle place), offering lots of space. The kitchen is open, so customers can actually watch the ……..
Joma That Luang features the same delicious menu as the other two Joma cafes in Vientiane, with a nice cozy ambiance. The That Luang outlet (or should I call it Joma III? ), although smaller than the Namphou and Phonthan branches, offers the same comfortable sofas and their Wi-Fi is impressively fast. This latest outlet will reinforce Joma being the first-choice lunch stop for many Expats living in Vientiane, especially with its location close to …. The number of dengue fever cases recorded in Vientiane so far this year is already six times the figure registered for the same period last year. So far, this year more than 3,000 people have been infected with the virus nationwide, resulting in 11 deaths. Of this figure, 634 cases occurred in Vientiane, where six people have died. Laos has ratified its membership of the World Trade Organization, the latest step in the small Southeast Asian nation’s 15-year effort to join the global body. The Laotian parliament on Thursday formally gave its approval, paving the way for the country’s entrance to the 157-member organisation in early 2013. …. Do you want to build or refurbish your house, and are looking for solutions solving your needs? Would you like to waterproof your roof or install a tiled or a wooden floor? Or are you interested in finding the right solution to just bond a soap holder in your bathroom? Sika got it all! Sika AG, located in Switzerland, is a globally active specialty chemicals company. Sika is a leader in processing materials used in sealing, bonding, damping, reinforcing and protecting load-bearing structures. Sika professional products have been approved on the biggest jobsites in the world and the same quality is now available at Sika Km4 Retail Shop. Do you also have a dream of spending a few days on a lonely island surrounded by water and green nature ? Well, my dream came true when I decided to escape the “hustle and bustle” of the ASEM meeting and headed north towards the Nam Lik River. I was invited by Adam, also a J&C team member, to join him and his friends to spend some time at their holiday house which is located on a small island on the banks of the Nam Lik River, about 110 Km north of Vientiane. Which Is The Best Mobile Phone Operator in Laos ? Some 2,500 to 3,000 people from across the country are expected to attend the official consecration ceremony of the Vientiane City Pillar Shrine this November 15 to 17. The activities will include religious ceremonies and traditional celebrations. Items of value will be placed on …..
Boun Ork Phansa is the last day of Buddhist Lent. Taking place three lunar months after Khao Phansa, the day is one steeped in tradition and brought alive by celebrations which begin at dawn and continue on way past dusk. As morning breaks, people across the country flock to temples to present offerings of money and food to resident monks. The morning offering ceremony is quiet and reflective – the calm before the storm of festivities to come. According to the J&C monthly poll for September / October, our readers declared the pool at Settha Palace Hotel as their favorite, with 29% of the votes. Second place goes to Rashmi Hotel (18%) and third to Sengdara (16%) … congratulation to all three winners ! The Settha Palace is a luxury boutique hotel with French colonial architecture in Vientiane, Laos. Built in the early part of the last century, circa 1932, and painstakingly restored to its former imperial glory, the Settha Palace Hotel serves as a testament to the long lost era of classical elegance, gracious service and …..
After being renovated for almost a year, the Nam Phou fountain reopens to the public and international tourists. Being granted with a concession lasting 30 years, the developer, Asia Investment and Finance Service Company, confirms that the fountain will remain a public space where local people and tourists can come to relax and enjoy the facilities. The developer had to modify the original design six times to accommodate the public fear of …..
Four in ten heads of small companies continue to work from their sick beds, as their business would collapse if they were to take time off. It seems that employees may also be compounding the problem, as 46% of small and medium-sized enterprise bosses say that high levels of employee absence are estimated to contribute up to a 10% drop in turnover in small businesses. Yet staggeringly, despite these pressures, 38% of bosses admit that they spend more on office stationery than on initiatives that support employee health and wellbeing, such as flu jabs, cycle to work schemes and subsidised gym membership. These findings reiterate the impact that ill health can have upon a business…..
On 1 October a new and unique educational facility opens in Luang Prabang, the LEOT English Learning Centre. A purpose built Centre, with state of the art facilities and all graduate teaching staff, it will serve the needs of the underprivileged young adults who cannot afford fees to attend the existing language schools , by offering totally free enrolment and teaching. The parent and funding body, LEOT (Lao Educational Opportunities Trust) has been operating in Laos for 6 years offering a scholarship programme, enabling young people to study at College and University. At any one time it has 20-25 students on its programme (see www.leot.org.uk). The new Centre is funded by voluntary donations; mostly from UK but also, Australia, ….. Both Coordinators of My Time, Clarissa Power (Manager Kongkhao, BSW) and Jan Burgess (Early Childhood Teacher, B.Ed) are aware of the need for young families to socialise. With this in mind they are trialling a morning group that will cater for children under school age. The aesthetically pleasing garden and children’s play area at Kongkhao Restaurant and Gallery provides the ideal atmosphere for socialising. Parents can come and relax, network and learn from each other as well as their children. Topics of interest will be explored and discussed on a regular basis as ….. If you’ve got a digital camera (or even a smart phone), some white walls and another person, you can get your own visa photos for nothing – instead of paying the photo shop for six photos. When my buddy Ong suggested to have authentic Turkish food, I was actually surprised as I didn’t knew that such exists in Vientiane. 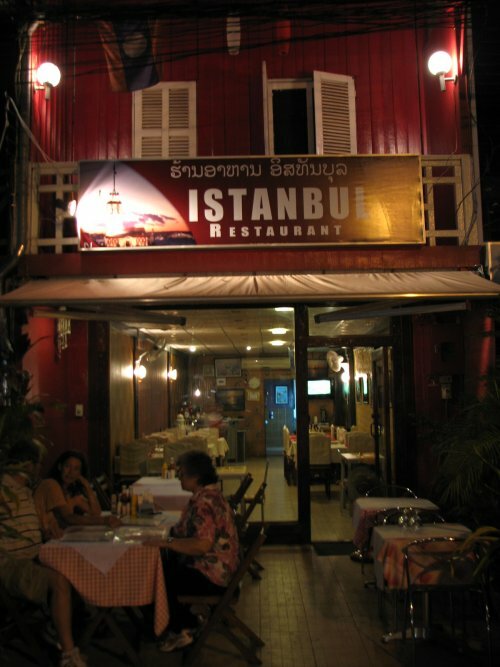 The Istanbul Restaurant run by an elderly Turkish man who also happens to be the cook and cashier is located near to the Mekong River in the heart of Vientiane. We were presented with well illustrated menus with pictures of Turkish food including descriptions. Having browsed the menu I noticed that there was lahmacun or Turkish pizza which I have never ever tried and a mouth watering list of doner kebab selections. In addition, there was even a page on the menu to cater for vegetarians comprising of falafel, imam bayildi, kizartma and pilav rice. The survey was completed by over 650 expatriate policyholders from all parts of the world. Only 32.9% of those questioned had life and/or income protection insurance. On the other hand, when life and income protection insurance clients were questioned about their health insurance arrangements, just under 70% said they had health insurance in place. The results of the survey suggest that expatriates are far more likely to insure their health than make financial provision for either their untimely death, or the risk of them being unable to work due to an illness or injury. Now it’s official: Via Via makes the best pizzas in Vientiane ! According to the J&C monthly poll for May/June, our readers declared Via Via’s pizza as the clear favorite, with 34% of the votes. Second place goes to Aria and third to Swedish Pizza … congratulation to all three winners ! Following up on my previous article regarding the first establishment of the Black Canyon Coffee Restaurant in Laos , I recently took my dinner there. I was generally impressed with the interior and decorations within the premises. We were immediately whisked to a table for two and served by one of the many male waiters who immediately passed us the food and drinks menu right after we were seated. The laminated menu are fully illustrated with all photos of soup, sandwiches, salads, spicy salads, appetizers, a la carte, curries/soups, noodles, pasta, steaks, rice dishes and there was even a section for Lao delights. Most items on offer have actual photographs and this did indeed titillate my taste buds prior to my dinner. With the city developing at a rapid pace, the real estate prices are soaring in Vientiane. In prime business areas of the capital the prices are around $2,700 to $3,500 per square meter; the prices are expected to keep rising. By comparison, in residential areas of Vientiane, one square meter goes for between $500 and $700, and in rural areas nearby, between $15 and $50. The Pizza Company, one of the most popular fast food franchise restaurants in Thailand, has opened the company’s second restaurant in Phonesinuan village, Vientiane. The restaurant has been well received among domestic and foreign consumers in Laos, as more people develop a taste for international food. In the past, large numbers of people crossed the border to Thailand to eat at restaurants serving Western style food. Lao Central Airline, the first private-owned airline based in Vientiane, is now ready for take-off according to their latest advertising campaign. Lao Central Airlines will fly 3 times a week to Bangkok & Luang Prapang (Monday, Wednesday & Friday). The Airline is using mid-sized jet aircraft to target the regional market. Lao Central Airlines wants to position itself as a premium low cost airline by applying aggressive marketing strategy to gain market shares. Driving along Samsenthai road, the black building with white letters reading “Guru Shop” immediately caught my eye. Don’t tell me they opened a spiritual center, I joked to myself. Curious as I am, I turned around and entered the “temple of wisdom”, which turned out to be the latest Apple shop in Vientiane. “Our goal is to introduce as many people as possible to new technologies and gadgets, and teach them how the gadgets can make their daily lives easier”, explains Eddie Savankham, the owner of Guru Shop. The J&C poll results are in for March 2012. We asked readers to vote for who has the best hamburgers in Vientiane. There was close competition throughout the month but in the end Xayoh Grill House came up first with 24% of the votes. Currently Robinsons, reborn as Central Plaza, is undergoing major building work to make this shopping mall the biggest in the Isaan region. Once finalized, the shopping mall area will be 30,000 square meters, making it bigger than the Central Plaza complex in Khon Kaen. I was told that the renovations are due to be finished in March 2012, although given the the current progress it seems it may take a bit longer. The Bank of the Lao PDR is urging the public to join forces to combat a rising tide of fake US dollar banknotes and other foreign currencies. The central bank made the call last week after learning that a group of people were circulating large numbers of fake US$100 notes and other currencies in Laos. The bank is concerned about the damage this can inflict both on individuals and the national economy. Lao Telecom operators are forecasting higher earnings this year after agreeing to set the minimum mobile phone call rate at 800 kip per minute. LTC, ETL, Star Telecom and VimpelCom Lao reached the agreement at the end of last year, saying call rates would not fall below the minimum except on special occasions. This has enabled them to revise their revenue growth forecasts for 2012. Yesterday the body of Melbourne student Daniel Eimutis, 19, was found in a river in Vang Vieng, three days after he went missing while tubing with friends. Family said he had drowned. The tragedy comes less than a fortnight after Sydney traveller Lee Hudswell, 26, was killed after jumping from a tower while tubing in the same area. Reports at the time said at least 22 people had died in the river last year. In a significant first, Thailand and Cambodia have announced they will issue a single 30-day tourist visa to non-ASEAN visitors from February 1, with Vietnam and Laos to be brought into the ambit by end-2012. Cambodia’s minister of tourism, Thong Khon, revealed that the next step would be “to include Laos and Vietnam, develop the road network well and offer our four countries as a package to foreign visitors, a unique concept offering in Asia”. The Vientiane authorities have finally agreed to the project design, which is the sixth that the developers have submitted. Originally, a two-storey restaurant was planned but the authorities refused to approve this and requested a more modest structure that was in keeping with the size and character of the square. 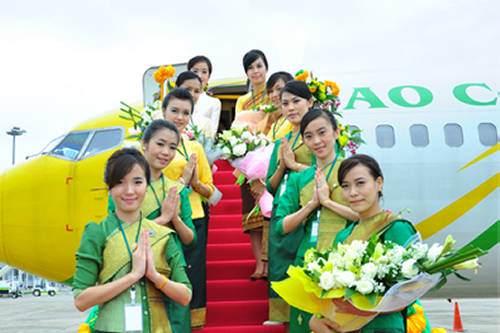 Fledgling airline Lao Central Airlines Public Company (LCA) wasted no time in getting off the ground after taking delivery of its second jet on December 27 and ran a special flight from Vientiane to Luang Prabang last Friday. Flights cannot be offered yet because more time is needed to prepare ticket sales and organise services management, but now that it has two planes, as required by the Ministry of Public Works and Transport, the airline can offer flights at any time. Plans to turn Vientiane’s That Luang marsh into an attractive urban development envisage an area of green spaces, wetlands, a public park, new roads, residential areas, and commercial centres. The plan would divide That Luang marsh into five zones, covering an area of 2,200 hectares, of which 660 hectares would be dry land and the rest wetlands. Most people agree that if That Luang marsh is developed as planned, Vientiane could be one of the most liveable and sustainable cities in the region. The Japanese cars and sport utility vehicles that clog the streets of Laos’s once sleepy capital are testament to the changes quietly under way in a county once seen as a basket case isolated for decades behind Asia’s bamboo curtain. Nominally communist since the overthrow of a U.S.-backed government in 1975, the former French colony is courting neighbouring China, Vietnam and Thailand to develop resources and infrastructure, and they are piling in, indifferent to the risk aversion that keeps Western firms on the sidelines. Small private airline PC Air says it will begin operating charter flights this month with Bangkok-Vientiane service and will start serving China next month. Last Friday the airline held its first trial flight between Bangkok and Hat Yai. PC Air is the first airline in Thailand to hire all genders. PC Air’s four transsexual flight attendants are believed to be the world’s first transgender flight attendants. Vientiane Police Headquarters has issued a warning notice to villagers, public offices and business units to be on the alert for possible fire outbreaks during the dry season. The warning comes as authorities aim to reduce the number of fire incidents in the capital, which have cause loss of life and property in past years. Electrical shorts and lightning candles have been among the main causes of fires in Vientiane in the past. When reading in the local newspaper that the Morning Market Talat Sao mall 2 was officially opened on Friday, 11 November 2011, I was curious to see for myself if the new mall would meet everybody’s high expectations. Visiting the mall this Saturday, I was rather disappointed, as only a few stores on the first and second level of the mall are occupied; everything else is still vacant or under construction. The “official opening of a shopping mall still under construction” would have been more appropriate as a headline. Speaking in response to the World Bank’s latest survey on the Lao business climate, both Laos-based and foreign firms say business tax rates are very high, making it difficult for them to stay competitive. The bank’s survey also highlights that businesses in Laos consider access to finance to be the second largest problem despite the rapid growth of banks and microfinance institutions in Laos. Air Asia has appointed Toko Assurance as the exclusive insurer for AirAsia passengers travelling from Wattay International Airport in Vientiane. All passengers on AirAsia flights will have the option to be covered not only whilst on board their flights but also for the entire duration of their trip when they purchase AirAsia travel protection. J&C Services, being one of the leading agents of Toko Assurance and their top agency in the “non-motor” insurance market, also attended the signing ceremony. The government will continue to set a fixed price as a reference for import tariffs on some commodities until 2013, despite calls from international companies to abolish the trade barriers, the Ministry of Finance announced. The hotel will also contain a shopping complex, as well as restaurants, entertainment facilities and a cinema. The Government has decide to allow foreign investors to own residential land rights after spending more than a year defining the details of the law. Foreigners who have invested US$500,000 or more in Laos can now apply to buy land from provincial and capital authorities in accordance with the amended Law on Investment Promotion. Under the new prime ministerial decree, eligible foreign investors will be allowed to purchase a maximum of 800 square meters of state-owned land for residential purposes or to construct on office building. Love Life Ice Cream is having its Soft Opening and I decided to give it a try …. and I certainly wasn’t disappointed! I went for a Vanilla & Chocolate ice cream in a big cone and enjoyed it until the last bite ! Love Life offers home-made ice cream, shakes and cookies. They are still testing and trying out new recipes and it seems that they really value the client’s feedback. Ice cream in a big cone is 12,000 kip, ice cream shakes (hard to find elsewhere in Vientiane) are 19,000-22,000 kip and fruit shakes are going for 12,000 kip. A strange reptile that looks like a cross between a snake and a lizard was recently found outside central Vientiane. The reptile looks similar to a snake with a long body but it also has four legs and moves like a lizard. The bizarre animal was found in Phonmee village, Pakngum district, Vientiane. The animal is over 30 cm in length, has very short legs, has striped and scaled skin like a snake and a thumbnail sized head. Going to YoQueen on Sunday afternoon, the shop was fully of young Lao people, but also some expats. The interior design is a fresh (and healthy) green, with comfortable indoor seating places, whilst the outdoor area featured small round tables and chairs. The perfect place to spend some time while enjoying a refreshing treat ! The upgrade project includes runway renovation, parking space expansion, drainage system renovations and road upgrades. The project aims to improve and expand apron 02 and apron 03 to provide 25 aircraft parking stands, improve the airport drainage system, and expand the turn pad of the runway to meet the requirements of Code-E aircraft operation. As many foreigners and People of Lao origin living abroad have expressed an interest in living in Laos permanently, the Lao Government is to introduce in the very near future a new decree outlining permanent residency requirements for foreigners. People of Lao origin living abroad, as well as foreign nationals, can apply for permanent residency in Laos once the new decree is approved by the government. As we all know, Laos is home to many rare and unique animals including tigers, black bears, elephants, deer, dolphins, gibbons, giant catfish and crocodiles. Luckily most of these won’t turn up in your backyard. What I personally wasn’t aware of, however, is that Laos is also home to some of the most dangerous snakes in the world. Coming originally from a “cold” country, I’m still trying to get used to the idea of having to share my garden with venomous cobras and vipers. Wearing coloured contact lenses has become fashionable among youngsters in Laos. More and more young people from schools and colleges are buying them, believing they give them more beautiful eyes. The new trend however has a serious downturn: if the coloured lenses are not kept clean it can lead to a variety of eye infections. Ban Moon Restaurant and Beer Garden is a true-blue Aussie ‘home-style’ restaurant set in the garden terrace of Barry and his wife’s Vientiane home. As you walk in you will be greeted by Barry with a nod and a handshake and ushered to your seat for possibly the coldest beer in Laos. And this is what makes the place so great; it’s comfort food in a comfortable setting. Being an expat involved in a road accident can become a very unpleasant experience, mainly due to the fact that most foreigners do not master the local language and therefore are not always able to explain to the police the the accident happened. The nightmare of having to deal with the police and the other party on your own can easily be avoided if you have an up to date insurance policy for your vehicle. office. This is necessary by law and also important for your safety as the authorities will know who and where you are. The process is simple. Bring your passport, Lao ID, work permit and a few photos. The village office will do the rest. Many rental homes include a nice lush lawn that really brightens up the yard and is great for kids to play in. But after a few months this can grow into a messy jungle if not properly maintained. What you need is a good lawn mower. Options for furniture purchase have increased with the opening of two new furniture outlets in Vientiane. For those wanting more comfortable furniture in your homes, look no further than the Index and Winner Showroom by LP Furniture Centre in Nonghai Village on Kamphengmuang Road. All purchases can be home delivered for free.